You are here: Home / Uncategorized / Cook Out NYC & Giveaway! Cook Out NYC & Giveaway! Ever wanted to know how Kimchi is made? Ever hear of Kimchipalooza? 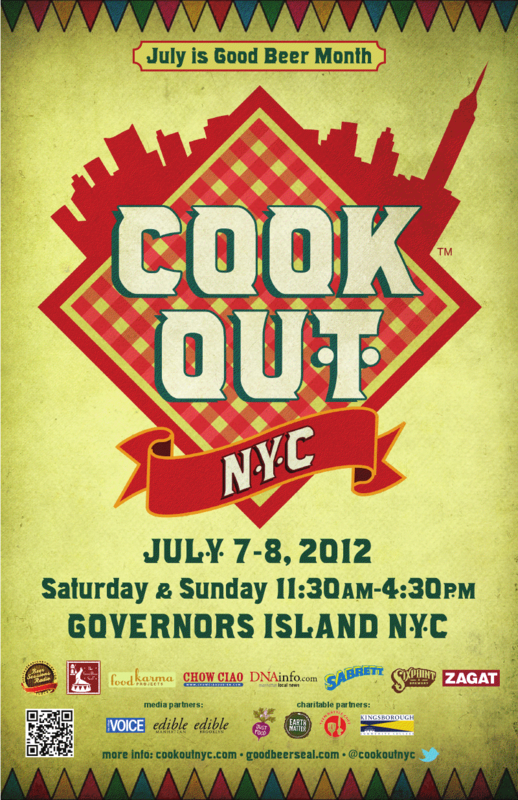 What about Cook Out NYC™? On July 7th and 8th from 11:30 a.m. to 4:30 p.m., Governors Island will host the return of the ultimate outdoor cooking and country fair event, complete with Mama O’s Super Spicy Kimchi-Eating Contest, Kimchipalooza, not to mention a Fossil Farms burger cook-off with sustainable meats, a Sabrett’s hot dog competition with boutique toppings, more than 20 BBQ and grilling stations, as well as craft beer from local Brooklyn brewery Sixpoint. Proceeds from the event will even benefit community groups like Just Food and Chefs for the Marcellus. on demonstration, coupled by a splendid sampling of Cook Out NYC™ food and drink, they were lucky to have their own freshly made kimchi to take home! I jealously watched all of @divathatateny and @justcooknyc tweets and Instagram pictures, it looked like such a fantastic time! Any of this sounding appetizing? Well, you’re in luck because one Cooking with Books reader is set to win a pair of VIP tickets to Cook Out NYC™ on July 7th or 8th (a $120.00 value) this Independence Day Weekend. Entry Method:Just style your most creative tweet as to why you should be our winner and include both @CookOutNYC and @nella22. We’ll choose our winner by Thursday July 5th and place you on the VIP list! And what if you don’t win? Well, you’ll just have to purchase tickets using the exclusive discount code. Just enter “BlogOutNYC” at checkout to receive $5.00 off your ticket purchase. Disclaimer: I did not receive any monetary compensation for this post and I SO wish I was in NYC for this event, but alas, I can’t be, so I am sharing it with everyone that can possibly make it!